CityGrows makes it easy to clone any template in our system, whether it's one you or one of your colleagues made, or one created by another government or by the CityGrows team. Cloning a template makes it easy to take a process that another government has already implemented, tested, and refined, and customize it for your own use. Cloning and then customizing one of CityGrows' sample templates can be easier than starting from scratch, especially the first time you create a template on CityGrows. You can clone a process at any time by visiting the process landing page when you're logged in with an admin/ government account on CityGrows. When you are, you'll see 3 small dots next to the process title. If you click on them, you'll see the option to clone the process, and then you'll be prompted to add the cloned process to one of your teams. Sometimes you want to clone something you made yourself. You might want to restart the same process each year, if any components of it change each year (of course, you can also just update the same template). 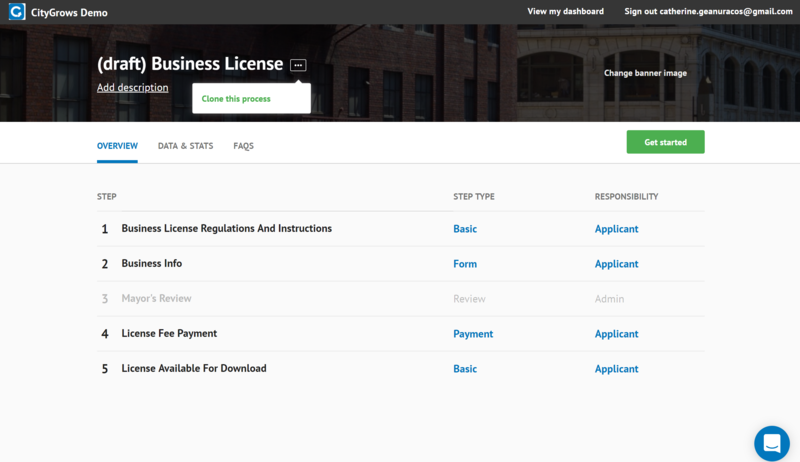 Or you might have several different business license types, and want to use the same basic process for all (although in that case, you might want to use just one template and include logic features to accommodate multiple types of applications in one process). Once you've cloned a template, you can customize it however you like: Add in new staff as reviewers, change the order of steps or questions, and modify it the way you would any other template. Just be sure to send a thank-you message to the government who originated your process if you end up using it with your constituents!